Warsaw senior star Lindsay Baker will look for a semi state championship at home on Saturday. WARSAW – You better believe that the Warsaw girls basketball team is looking forward to playing one more home game this season. On the other hand, the Fort Wayne South Side girls hoops squad knows a thing or two about playing tough teams on the road. Whatever the case, both teams need just one more win Saturday in the Warsaw Semistate to get to play for a state championship. That fact, regardless of where the game is being played, has to be the motivating factor for a pair of talented and veteran teams. The No. 8 Tigers, who are perfect at home this season, play host to the No. 11 Archers in the Class 4-A North Semistate at approximately 6 p.m. The game will follow the Class 2-A semi state showdown between Fort Wayne Luers and Eastern, which tips-off at 4 p.m. Saturday in the Tiger Den. The winner of the Warsaw (24-1) versus South (23-3) game earns a spot in the Class 4-A state title game at the Hulman Center in Terre Haute March 2. They will face the winner of the South Semistate at Bedford North Lawrence Saturday, pitting the No. 2 hosts who are 26-0 versus No. 6 Indianapolis Roncalli (24-3). Warsaw is making its sixth semi state appearance overall in the program’s rich history and first since the 2003-04 team, led by Miss Basketball Jaclyn Leininger, was state runner-up. South’s only other semi state appearance came in 2008. Both coaches, Warsaw’s Michelle Harter and South’s Juanita Goodwell, tried to downplay the venue for the first-ever meeting between the two teams. Goodwell, whose team played just five home games this season, says her team knows how to play away from its home court. The Warsaw players, understandably so, have a little different take on being in familiar surroundings in front of a sea of support. 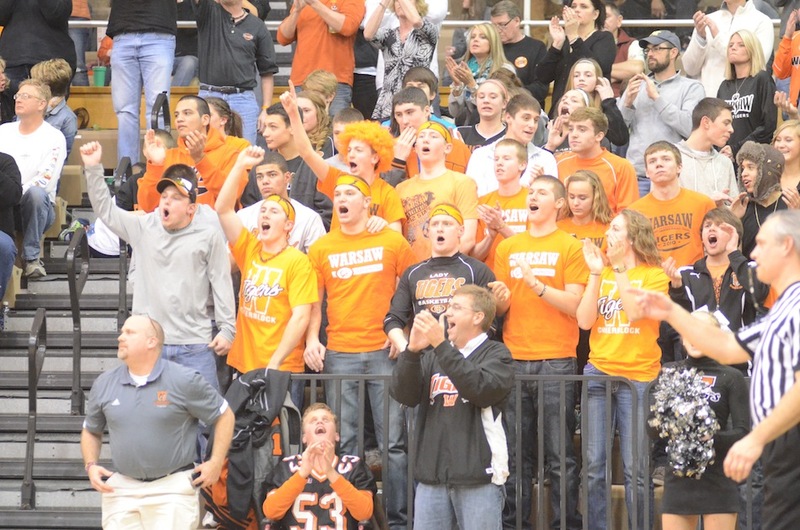 Warsaw sold all 1,200 of its semi state tickets in just a few hours Wednesday after they went on sale. The Tigers have also won their 11 home games this season by an average margin of 22.4 points-per-game with the closest contests in the Tiger Den being a pair of 10-point wins over conference foes Plymouth (51-41) and Wawasee (43-33). The five senior members of the Tigers, Walker-Crawford, Lindsay Baker, Melanie Holladay, Sarah Ray and Gabby Monroy, talked about this chance back on Senior Night (the final home game of the regular season) Jan. 31. “Senior Night started this train so to speak,” said Baker at Media Day on Wednesday in the Tiger Den. “That’s when so many people were telling us and believed that was not our last game here that we could be back for a semi state and here we are. Holladay, the hero of the 42-41 regional title game win over Merrillville, also points to the calming effect of playing at home. Junior Brooklyn Harrison has given No. 8 Warsaw a lift with her play in the postseason. The game itself, similar to the Warsaw-Merrillville regional final, provides a contrast in styles. The defense-minded Tigers (who are only allowing 34.8 points-per-game) like to play a patient game, take good shots, and dictate the pace of the contest with its highly-effective 2-3 zone. South, described as relentless by one coach who faced them this season, features an athletic squad that likes a pressing, uptempo game. “The tempo of the game will be huge,” said Harter, who played on the 1985 state runner-up team for coach Dale Brannock at Wawasee High School. “South is very athletic and very quick and they want to push the tempo. It’s very important for us to control it and play under control and not allow them to speed us up. Goodwell, whose team averages 63.8 ppg., says her team wants to speed it up. “We want to put pressure on our opponents and control the tempo,” said Goodwell, who is 80-18 in her fourth year as the South coach. “But, we’ve played and been successful in all kinds of games this year. We know Warsaw is a very solid and good team and we know the threat that Baker is. Baker, Warsaw’s unquestioned leader, adds a unique perspective to the matchup. The six-foot shooting guard, who is bound for the University of Toledo and leads her team with 50 treys, is very familiar with South. “I did some private training with their coach and assistant coach in the offseason and it was in the South gym,” related Baker. “It makes me laugh now to think about it. Warsaw, who is 80-30 the past five seasons under Harter, is led by its terrific trio of Walker-Crawford (14.0 ppg. ), Baker (11.7) and 6-1 junior Nikki Grose. Grose, who was outstanding in the pair of regional wins last Saturday, averages 11.5 points and a team-high 9.5 rebounds per game. The starting lineup also features Holladay (5.4) and junior Eryn Leek (2.3) in the backcourt. 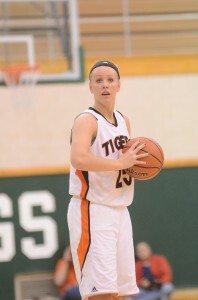 Junior guard Brooklyn Harrison, who has given the Tigers a key boost with her play in the postseason, and steady senior guard Sarah Ray are the top two reserves for the Tigers. The Archers, who lost in the regional semifinals a year ago, boast a balanced attack. 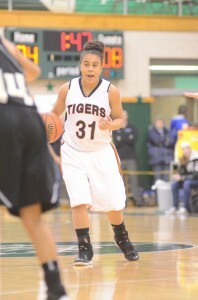 Senior Ariana Simmons is the key for South. The 5-11 forward, who has signed with IPFW, averages 14.3 ppg. Simmons had 20 points and 15 rebounds in a 71-55 win over Logansport in the regional final at Kokomo last Saturday and 21 points in a 58-56 victory over Westfield in the regional semifinal contest. The South starting five also features 5-7 senior guard DeJoyah Johnson (9.9), 5-11 junior forward Brittni Clopton (9.8), 5-6 junior guard Lekyn Gulley (7.3) and 5-7 senior guard Lynnia Noel (6.1). Gulley is the team’s top outside threat with 53 treys on the season. Warsaw’s lone loss this season was a 34-30 decision at league foe NorthWood on Jan. 26. South has lost to Homestead (81-80), Columbus North (57-35) and Bedford North Lawrence (63-39). The Archers did beat Homestead though 54-53 in the sectional final. The Tigers and Archers have played four common opponents in Huntington North, Penn, Fort Wayne Luers and Fort Wayne Carroll. Warsaw defeated Huntington North 64-42, Penn twice 55-42 and 49-42, Luers 61-44 and Carroll 62-43. South beat Huntington North 57-49, Penn 61-51, Luers twice 75-54 and 67-60 and Carroll 81-33. Warsaw’s girls basketball fans, shown above at the Valparaiso Regional last Saturday, are sure to be out in full force for the semi state at home this Saturday.